Bits and Pieces 15: Is Climate Change Threatening Our Food Supply? The Palmer Drought Index has been used since 1890 to measure drought conditions on a scale of zero (normal rainfall) to -4 (extreme drought). If you agree that it is, then please sign the petition below, urging Congress to act. The author asked Congressman Frank Lucas at his town hall meeting last May if he would consider investigating the effect of climate change on our food supply. Congressman Lucas said he could not commit to it, but he would consider it. However, more than a year has passed and an investigation has not been undertaken. Recently, Congressman Lucas’ campaign ads point out he is trying to keep food prices affordable by opposing government regulation on the size of chicken cages. However, climate change is a much greater threat to food prices and to our food supply. Heat waves and droughts are becoming increasingly common and are greatly affecting food production and food prices. 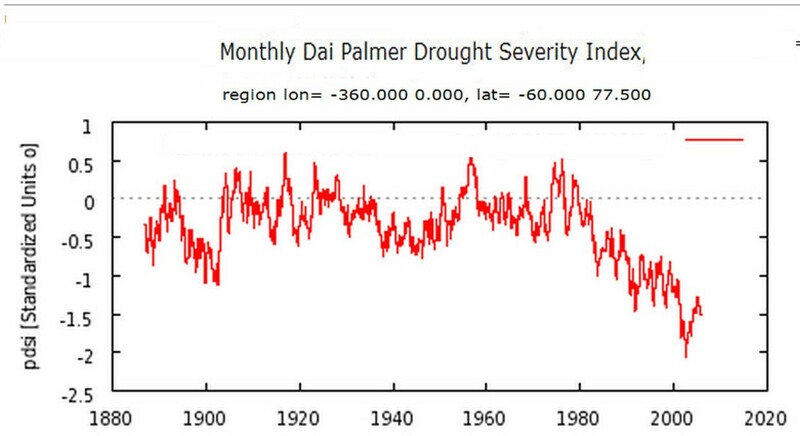 During the last 30 years, the Palmer Drought Index, which measures drought severity has fallen as low as -2.2 for the latitudes at which crops are grown. That is much, much lower than even the dustbowl days. This is serious. Currently, 64% of theUnited States is under drought conditions. This year’s corn crop is expected to be 10% less than last year’s, which is driving up the price of food products and animal feed. A round bale of hay, normally $20, may be as high as $100 next winter. Last year’s droughts and heat waves reduced the cattle herds by over 3 million animals, and many ranchers are now selling off part of their herds so they can afford to feed the rest next winter. This has kept prices low for now, but the effect will be seen later in the year. In the past, climate scientists could only predict that climate change was increasing the probability of severe weather, heat waves, and droughts – but they now have enough data and computing power to estimate the probability of extreme weather events. Recently Stott, et. al. found that, due to global warming, the heat waves and droughts in Texas and Oklahoma last year were 20 times more likely to happen than in 1950. . Research by Hansen et. al. found the probability of extremely hot temperatures are now 10 times as likely as in 1980. That means that extreme temperatures that affected less than 1% of the landmass in 1980, now affect almost 10% of the landmass annually. What we are experiencing now, will likely be the norm for the future. If you are concerned about food prices and the future of our food supply, please click on this link, petition on signon.org , to sign the petition urging Congressman Lucas to lead the Agricultural Committee in an investigation of the effect of climate change on our food supply. Then, please forward a link to the petition to your friends and contacts. This entry was posted on Monday, July 23rd, 2012 at 10:59 am	and is filed under Bits and Pieces, Climate Change. You can follow any responses to this entry through the RSS 2.0 feed. You can leave a response, or trackback from your own site. It is important to understand that climate change is not the same as daily local weather phenomena. You may be experiencing an unusually cold day where you live–that is irrelevant. The issue is the pattern that has emerged when looking at GLOBAL AVERAGE temperatures taken over many, many years. That being said, extreme storms and unusual weather phenomena are completely consistent with the climate change model. The global average temp has increased 1-2 degrees in the past century, and the trend is exponential, not linear. A relatively small change in global ave. temp. can have a significant impact on regional climates, as we have witnessed during the past few years. While it is true that climate shifts have taken place naturally in earth’s history, the alarmingly atypical factor in the current trend (beginning at the dawn of the Industrial Revolution and especially during the past few decades) is the RATE at which average global temperature (and atmospheric CO2 concentration) increase is happening — measurably faster than anything previously measured in ice core or geological/mineralogical samples that provide evidence of past climates. Record heat waves. Record flooding. Record blizzards. Record tornados. Record droughts. Record wildfires. Record permafrost thaws and ice sheet melting.